Leyton’s design range includes versions with arms, without arms, and with a wood surround on both armed and armless styles - please refer to the two additional Leyton brochures to see the full product range. 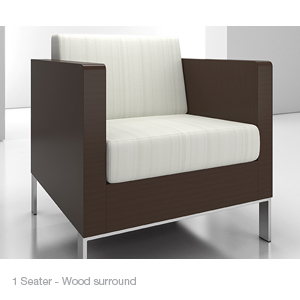 Seat and back cushions are fixed, but can be specified as removable (upholstery covers are replaceable on the removable versions). Table tops are available in standard and custom ranges of quarter- and rift-cut veneers, solid surface, and laminate. Heavy duty construction and material options make Leyton a solution for higher traffic and intensive use settings, including bariatric applications.